I’ll never forget the small neighborhood grocery market just up the street from our house on Sunny Lane in Lafayette. The name was simple – “Corner Pantry” and they carried all of the grocery essentials, plus the market featured a restaurant tucked just inside the store’s front door. We’d stop in there frequently with my mom while she shopped for groceries and their rotisserie chickens were a lifesaver for a mother with 3 children to feed and little time to cook dinner. Our family ate many a rotisserie chicken from Corner Pantry and we were always happy to have that option – it was certainly more healthy than fast food. 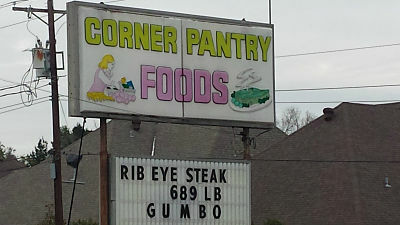 The Corner Pantry store sign on Foreman Dr.
During a visit home a few years back, my mom and I were discussing what we were going to do for lunch and I said “Let’s go and eat at Corner Pantry!” So, we hopped in the car and headed up the street to that old familiar neighborhood market. It still smells the same, y’all – and the sign advertising the rotisserie chickens – that sign is still there and I would bet it’s the same sign that was there nearly 30 years ago when my mom would stop in for a quick family meal in the early evening. 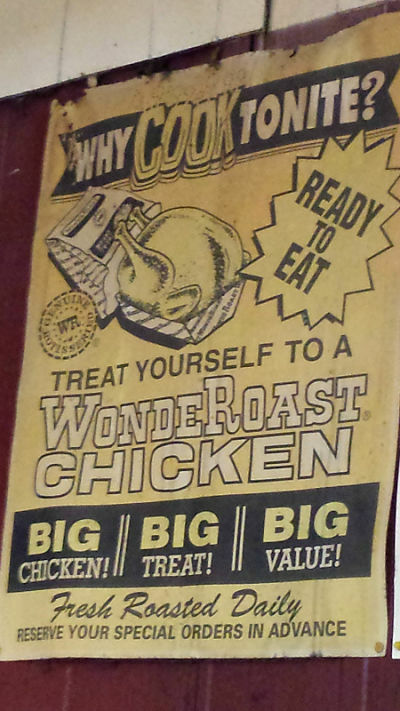 The vintage rotisserie chicken sign right over the chicken rotisserie in the store. We were seated in the restaurant – it wasn’t nearly as fancy as I’d remembered it to be as a child, but that’s fine. I’m not pretentious and I’d rather eat at a tasty, down home, casual restaurant than a place where I have to ask for definitions of their menu items because they’re so fancy. Those places usually tend to present the food in such an ornate way that it’s just absurd. I just don’t get it, but I digress…. 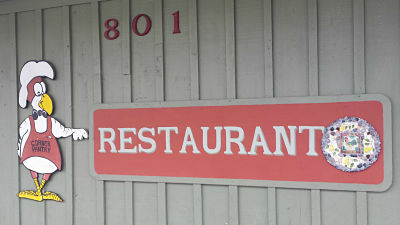 Corner Pantry’s restaurant – they also cater events. As I’ve pointed out in an earlier post, sometimes the best food in Cajun country can be found at convenience stores. They have daily plate lunches and they had chicken & sausage gumbo on the menu that day. My mom and I both ordered the gumbo – it came with your choice of rice or potato salad. It was very tasty – I’d stop in again next time I’m in town. After our lunch, we wandered around the store so I could reminisce. I found some King Cake flavored Blue Bell ice cream to take home and boy, is that stuff delicious!?!?!? I also learned that they host a farmer’s market behind the store on Saturday mornings. I think it’s fabulous that they are partnering with local farmers so they are able to have a farmer’s market in a residential area of town – some grocery stores would see farmers as their competition, but this type of partnership and sense of community is really what draws and keeps customers coming back. It’s proof that doing the right thing and being successful don’t have to be exclusive of one another. It warms my heart to see that this family owned business is still open after a solid 30+ years in business – perhaps more. As an entrepreneur looking to start my own business, their success gives me encouragement that there are customers who do value locally owned family businesses over larger, more corporate options. Shopping independent stores gives me a sense of belonging and purpose that I don’t get when I shop larger stores. It’s a warm, fuzzy feeling that doesn’t have a quantifiable price. What’s your favorite local store and why?